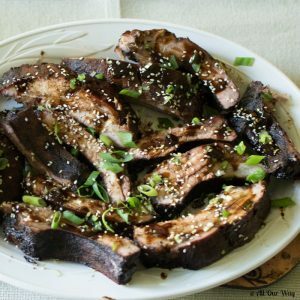 Asian barbecued ribs are one of those dishes that will tempt you to keep eating just because they are so doggone good. The spareribs are smoky, sticky, salty, and sweet. The aroma will tease your taste buds long before you even see the pork ribs. We celebrated Father’s Day on Saturday. 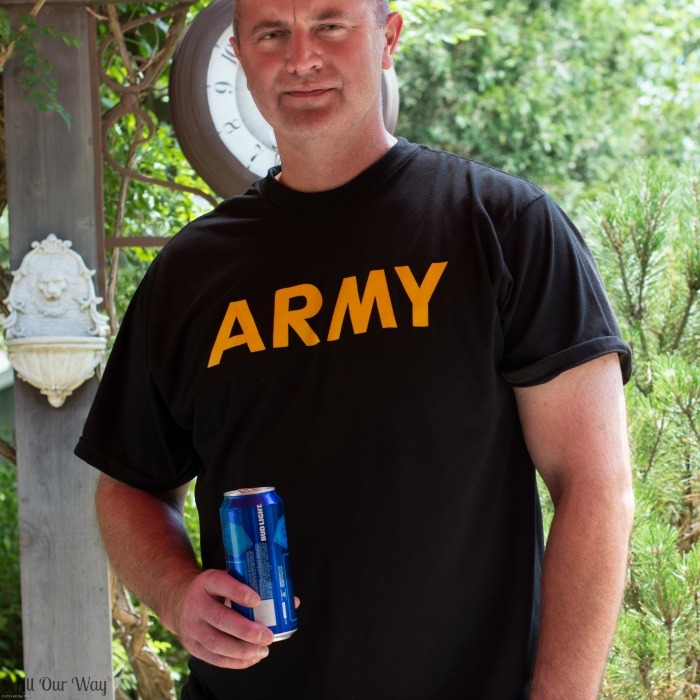 Jason, our oldest son, was on his way home from his two-week military duty. He was spending the night and leaving early Sunday morning. For the main dish, we decided to stray from the usual bb qued ribs and picked smoky Asian barbecued ribs instead. Honey insisted he’d cook the Father’s Day meal? Do you think that’s fair? Although, he didn’t seem to mind. If I would have prepared the ribs, he would have been a back-seat driver the entire time. It was easier to let him do it. Grilling to him is an art. It’s a step by step ritual that you have to follow. The men in our family really savor their grilled meat, and I have to admit I’m partial to it too. Grilling meat is a great way to visit and prepare the meal at the same time, don’t you think? Once the grill is ready, Honey lights the charcoal, plops the seasoned meat on the grate and watches the ribs like a hawk. As we wait for the ribs to smoke, we stand around and sip on our drinks of choice and catch up on all the family news. 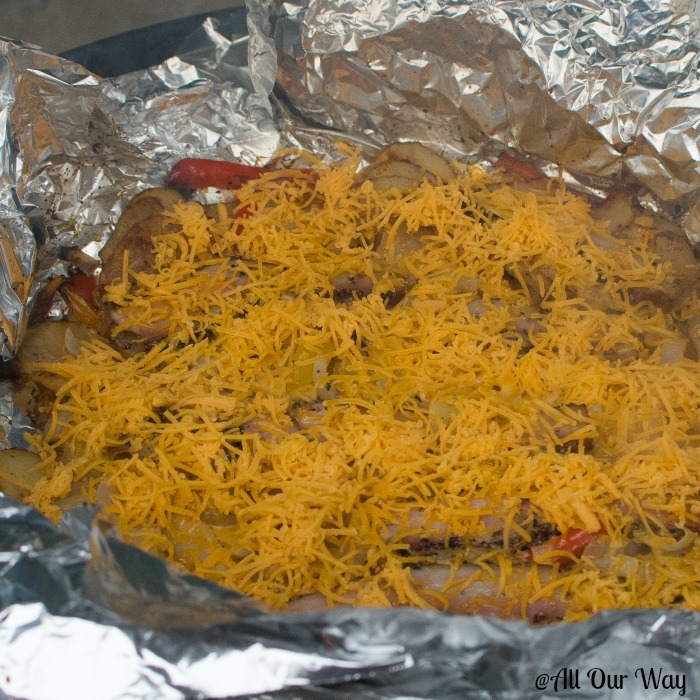 Along with our sticky ribs, we need a side so we pick cheesy grilled potatoes and peppers. It’s one of our favorites, especially since we can also make it on the grill. The afternoon flies by. How can you be busy and relaxed at the same time? It seems like that’s should be an oxymoron. Since we were all standing around, I commandeer Jason to be a model for one of my photography assignments. Thank goodness one of the males in the house is cooperative! Honey shies away from my camera unless he’s holding a fish. And then I can only get a shot of the fish. Did you ever wonder why I always cut off his head? 😣 That’s the reason. We complete the menu with tossed Italian salad and roasted asparagus. Normally Honey and I say our prayers and enjoy our meal. Saturday is different. Saturday we take the opportunity to linger at the table and to enjoy talking with our son. I can see why my mamma was happiest when her family gathered at the table and she could feed them with love. It’s certainly a joyous time. A time to sit around the table and give thanks for all that we have. We don’t take blessings for granted. Our Asian barbecued ribs are delicious! We hope you give them a try. They are easy to make and if you don’t have a grill you can also bake them. Now, gather together your friends and family, prepare a simple or complicated meal, see if your food doesn’t taste better with your company! You know, that is one of the secrets to “La Dolce Vita” — taking the time to appreciate the simple things like family, friends, and a good meal. 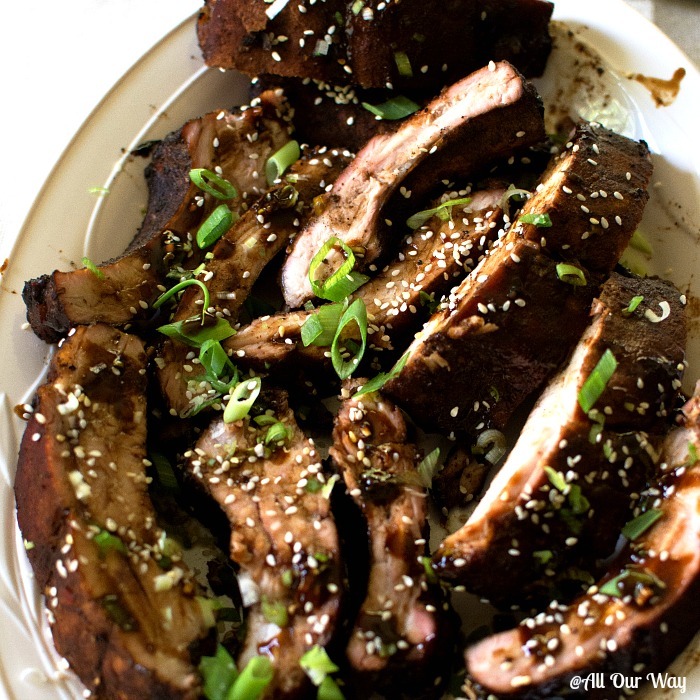 Asian barbecued ribs are deliciously tender with a sweet, salty, smoky, and sticky sauce. It is easy to make and can be grilled or baked in the oven. 3.5 lb. pork spareribs Trim off back membrane. Season with your favorite Asian rub we used Five-Spice. Cover with plastic wrap and set in refrigerator for at least two hours. Heat grill with indirect with indirect heat -- 250 to 275 F.
In small bowl, combine all of the ingredients except spareribs; mix well and set aside. 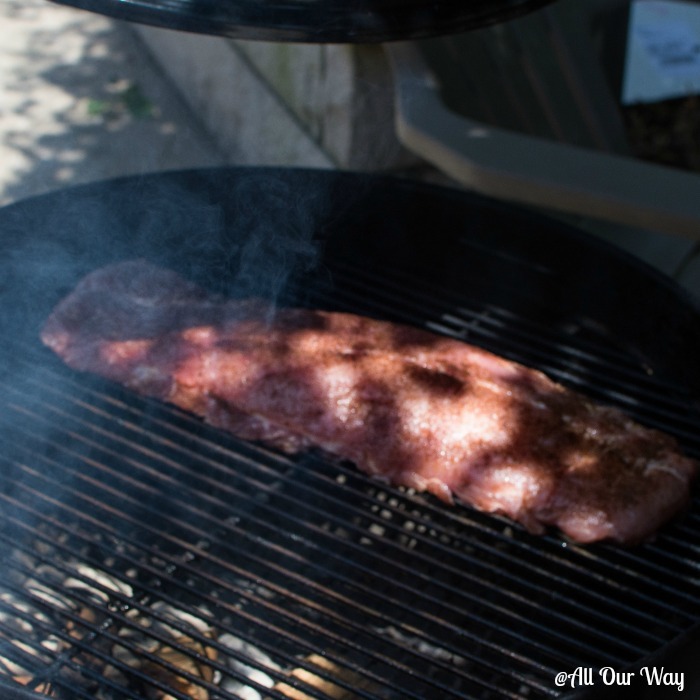 When grill is ready, place the ribs meaty side up on the opposite side of the coals. Cover; cook 2 1/2 to 3 hours or until meat is tender. It may take less time. Keep an eye on the meat. If the meat looks like it is drying too much lightly spray the ribs with apple cider vinegar. 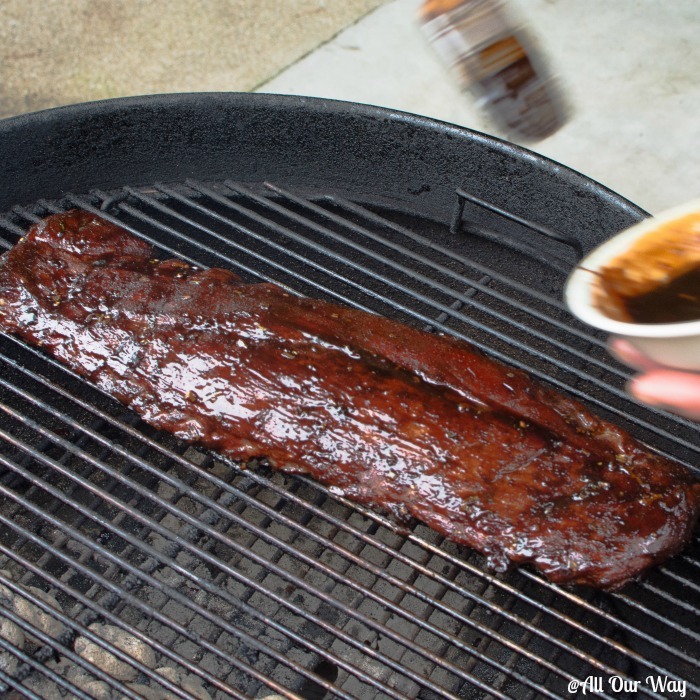 Pour some of the Asian sauce into a saucer or bowl -- you will baste the ribs on the last 30 minutes of cooking. Brush frequently with additional sauce. 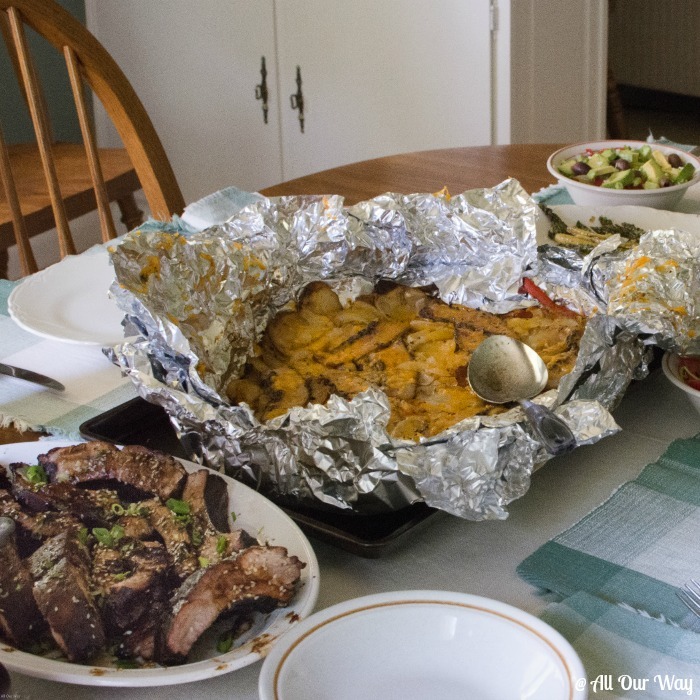 Remove from grill and cover tightly with foil and let the meat rest for 30 minutes in a cold oven. To serve, cut the ribs apart carefully with a knife and arrange on platter. Serve with additional sauce. Sprinkle with sesame seeds and green onion. Heat oven to 350 F.. Prepare sauce as directed above. Line 15x10x1 inch baking pan with foil; place wire rack in pan. Place ribs on wire rack, meaty side up. Bake for 1 to 1 1/2 hours or until meat is tender, brushing the sauce on the ribs the last half hour. Continue as directed above. Keep a special basting brush on hand for grilling. The brush should have a long handle to keep your hand away from the heat. If you place the brush in the entire bowl of sauce, make sure you heat the sauce to a boil before serving with the ribs. Note: Recipes and content from © 2017 All Our Way are copyright protected. 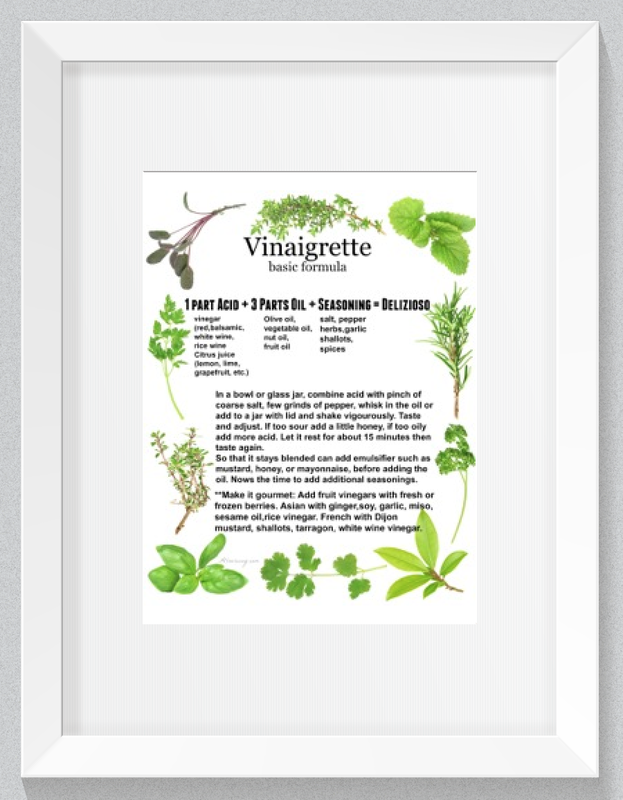 Please do not use content or recipe with prior written permission. If you want to share the information, please link to this post. Grazie. My family loves BBQ ribs, we will have to give this recipe a try. Thank you for the inspiration, this will be added to our weekly meal plan. That ribs looks juicy and delicious. That is great family dinner, Always family meals are special especially when we get everybody at the table. These ribs look sooo darn good! Lovin the flavors of the sauce…definitely trying this! You are making me want a grill SO BAD!!! This looks so good, I can almost taste it! Marisa this looks delicious. I love Asian flavors and it’s a nice change from using the traditional BBQ sauce. Oh, that is one awesome feast. Your family is so lucky to have you cook all these for them. I can’t decide if I want the ribs or the potatoes – Oh I’ll have both. Sounds so yum. Grilling makes summer fun. these asian barbecue ribs sound amazing I love asian flavors it’s a great change after eating Italian every day.. it’s a second favorite! I don’t know what I want more those ribs or those potatoes!! I guess I’ll just have to try them both!! I love the Asian flare for the ribs! I’m always down for some cheesy potatoes. Hubby and my oldest love ribs, they’d likely devour these in no time at all. These sound amazing! I can practically smell the aroma wafting through my screen, tempting me! Hi, Amy! They are good — we never have any left so I don’t know how they taste left over. Hi, Jeanne! I glad you found me, too. Hopefully, we can be great friends. 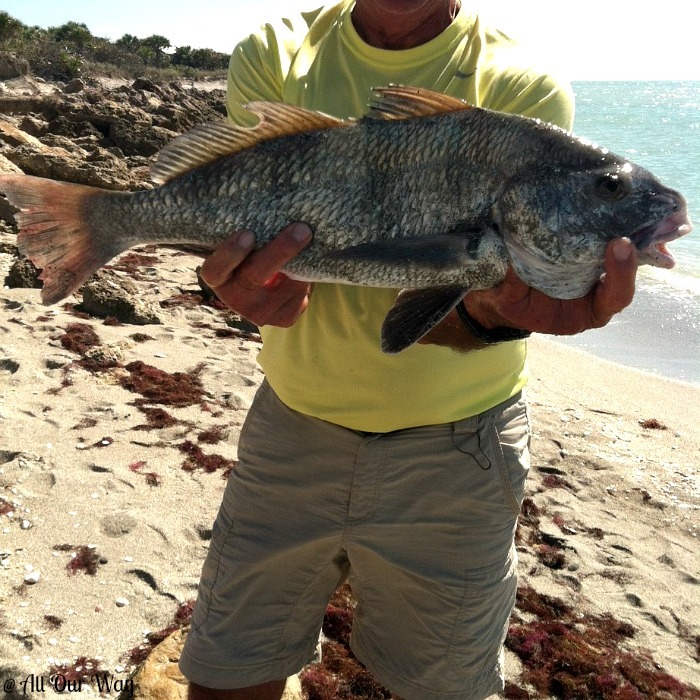 We enjoy hearing from our readers and we like for them to share what they’re doing. Are you planning a big Independence Day celebration? Hugs!! Oh Wow!! Now I am craving for some RIBS 😛 So happy for you that your son is visiting you 🙂 All the picture are amazing specially the fish one !! Thank you, Soniya! It is always a celebration when we can have our family around. And yes, that was one big fish!! 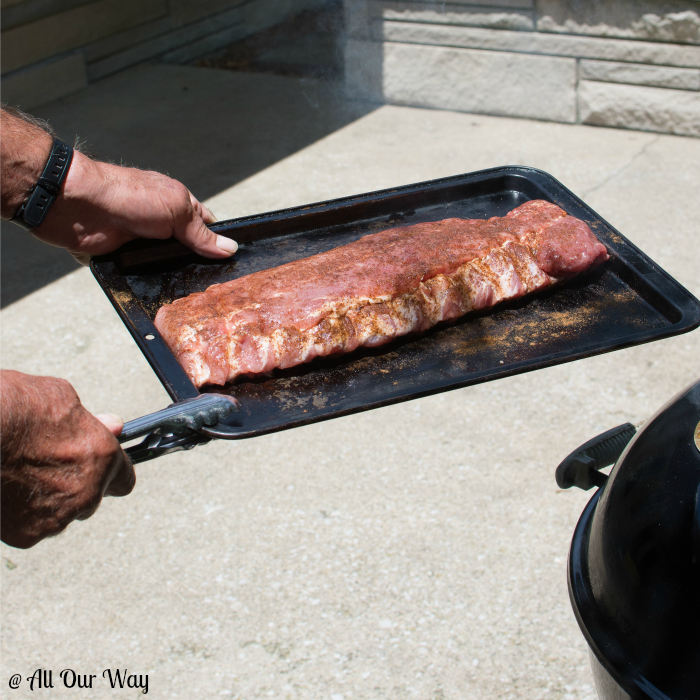 I know what I’ll have on my July 4th menu……ribs look delicious! We love Asian foods! So SPECIAL to have quality time with Jason…..he’s look good and so handsome. Tell him we said hi along with all the family. Also, tell Jason we’re proud of him and his service protecting our country🇺🇸🇺🇸🇺🇸 Also, GREAT catch grill master…..lots of good meals. Hi, Susie!! It was great having at the house. Normally our visits are too quick. This one was nice and slow with plenty of time to enjoy talking and a great meal. Love to everyone and give those grandsons a big hug and kiss from us. Hi, Molly! Thank you, they were good. Have a wonderful week!! I think I need to show these to my husband. I bet we will have them added to our menu pronto! Hi, Amanda! I believe you’ll enjoy the ribs! Have a great week. The ribs look delicious! The cheesy potatoes (still one of MY favorites), an incredible side. But my favorite part of the meal was the fact that your son was with you!! Family is everything Please thank your son for his service to our wonderful country. Even tho your hubby cooked, you had a great family get together! Hi, Diane! Hope you and Hubby had a great Father’s Day. Yes! A family is so very important. The day can go from ordinary to extraordinary just by having your loved ones around. Thank you for the gratitude. We are so very appreciative of past and present service. They sacrifice so much!! Abbracci e baci!! Now that looks like an awesome treat to come home to… Love a good BBQ and love Ribs. Asian flavors sounds so delicious..! The best part of summer lighting the BBQ! Looks yum! Hi, Veena! We do love cooking outside — just makes it all the more festive, doesn’t it? Hope you’re enjoying the beautiful outdoor weather. Those ribs look absolutely amazing! I love the sauce you used. That fish is mighty impressive as well! Thank you, Marlynn! The sauce is very good and I can’t tell you the excitement when that fish was brought in to shore!! Looks like a great family feast. Spending quality family time together is so important, yet so difficult to do with everyone running in all directions. I love cooking for my family…and I can see you do too. There’s not much that satisfies quite like grilled ribs. Those bones gives the meat such sweet flavor. And what doesn’t taste good with some hoisin sauce smothered all over it? You are so right, Frank! For a change, we sure do like that Asian touch. Hope your weekend is going well. That is a delightful BBQ option love the asian inspired flavors. Now I am craving some ribs =) That photo of yoru husband with the fish is incredible! Mmmm, BBQ is big at our house if my son is around. He is the official grillmaster! Your ribs look so good and the seasoning sounds so good, my mouth is watering. Thank you for sharing your recipe. Looks yummy! Of course it would be ok for your Honey to cook the meal 🙂 Tell you son I said, “Thank you for serving!” Glad he helped with your photography needs. I’ve shared on social media. Hi, Dee! I know Jason’s appreciates your gratitude. Thank you for sharing my post. Have a great weekend. Grazie, Chiara! Mi piace leggere in italiano. Ho difficile scrivere ma, puo leggere molto bene! I wish you were near, I would love to have you and your family for a meal al fresco. Abbracci!! Look sister, I’m never going to stick to my diet if you keep posting these amazing pictures and recipes! Oh my mouth is watering on this one…. So glad you got to spend time with your son, mine came home and ate dinner with us last night as well. (Crockpot roast!). There’s nothing like a family dinner. I bow to your determination! !You’ve stuck it out longer than I could!! Heck! This is the season of outdoor cooking with lots of snacky foods — can’t resist those. I think I’m going to start walking, you know, like a gerbil wheel to get my calories used up. And isn’t family the best??? I love those family meals – they bring tears to my eyes especially when you haven’t seen those special people in a while. Love and hugs — also to Ellie!! Oh my do those ribs look great. But that fish looks pretty darn good too. Thank you, Linda! It was good! Hope you have a great weekend. Oh yum. My kind of ribs. Boy do they look good Marisa. Must have been a fantastic dinner. Thanks for sharing. You’re welcome, Jovina! It was a great dinner – family is best, isn’t it?